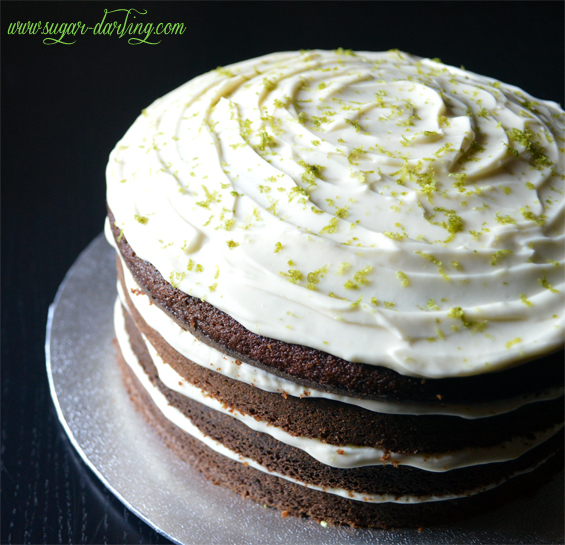 Recipe - Gingerbread Layer Cake with Mascarpone Lime Frosting - Sugar, Darling? I really love doing birthday cakes for people, especially when they are real cake fans. When I say a real cake fan I mean someone who wants an amazing tasting cake rather than some silly novelty sculpted icing debacle. Novelty cakes have their place, but I think a good old fashioned layer cake makes the best birthday centerpiece, topped with lots of candles and perhaps a sprinkle of edible glitter or simple cake topper. The cake I made for yesterday's 60th birthday party was just this. The Birthday Girl was a big ginger fan so we decided to go with this for the cake layers, and then I suggested lime for the frosting. Ginger beer with lime and fresh mint leaves is one of my favourite Summer drinks so I knew the flavours paired really well together. Avoiding the standard overly sweet buttercream is something I try to do most of the time now and we wanted something really creamy here, so I went with a mascarpone and cream cheese based frosting which when spiked with lime juice and jest worked perfectly with the richly spiced cake layers. This is a really fabulous cake and I suggest you try it for your next party or celebration, I think it would be lovely at Christmas too as the spices in the cake really lend themselves to a winter feast. Preheat your oven to 170 C / 350 F. Butter three 8" cake tins, line their bottoms with baking paper and butter that, then dump in about a tablespoon of flour. Tap it around the tin until it covers to based and sides, then tip the excess into the next tin. Repeat until all tins are buttered, lined and floured and then throw away the remaining dusting flour. Set to one side. Combine the bicarbonate of soda and boiling water in a medium sized bowl, stir and set aside. Sift together the flour, baking powder, ground ginger, cinnamon, cloves, nutmeg, and salt and set aside. Beat the butter and sugar together until they are really fluffy and pale, then beat in the treacle and golden syrup. Now carefully mix in the soda-water mixture and the flour mixture storring until combined before finally beating in the three eggs. Divide the batter evenly between the three tins, tap the bottoms a few times to get rid of any air bubbles and bake for 30-35 minutes or until the tops pop back when pressed lightly and a cocktail stick poked into the thickest part comes out clean with only a few crumbs stuck to it and no liquid batter. Let them cool for 10 minutes in their tins, then remove them to a rack and let them cool completely. Beat the mascarpone and cream cheese together until just combined, then add the lime juice, vanilla extract and all but about half a teaspoon of the zest mixing again until combined. now add 200g of the icicng sugar and beat until smooth and creamy and at a nice spreading consistency - you may need to add more icing sugar to get the consistency and sweetness that you desire so just add a few tablespoons more at a time until you have it just right. Take each cooled cake layer and using a serrated knife or cake leveller slice off the top so it it flat and level. You can get rid of all the top domed layers if you wish and just have a three layer cake, but I saved one of the domed tops to get a four layer creation as you can see in the photos. Now spread a generous amount of frosting onto each layer, stacking them as you go. 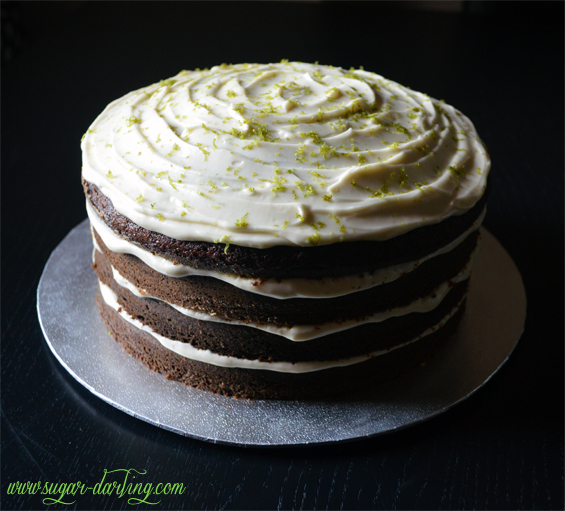 Finish the top off with another layer of frosting swirling it prettily with your palette knife, then sprinkling over the remaining lime zest and if you fancy a dusting of edible glitter. The cake will keep for up to two days, you'll need to keep it in the fridge because of the creamy cheese frosting. Remember to wrap it in cling film so it doesn't dry out!